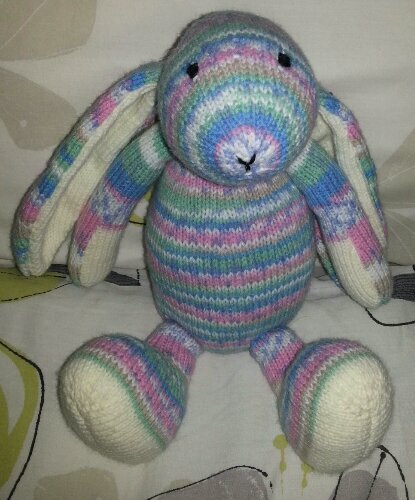 I decided I would allow myself to get a little bit excited and bought myself a Sirdar knitting pattern for a cuddly rabbit. I settled down to start, and like always happens I couldn’t stop, so I managed to make it in three days. It turned out positively adorable! Obviously as of yet I don’t know if I am having a boy or a girl so I had to pick a wool that would suit both, I picked Sirdar Baby Crofter 158 and I think it fitted the brief perfectly. I absolutely love how it has turned out! I find knitting very therapeutic, but it gives you a LOT of time to think. I didn’t allow myself to think much about the baby I would be giving the toy to – be they born now, silently, or at full term and screaming. They all deserve a toy. This pregnancy is turning into a mind exercise, training myself to be able to see and do things without allowing my mind to wonder and imagine. To stop the inevitable problems arising from endless free thinking, I set myself something to consider, something that made me think about both of my children and it also answered some questions I was silently wondering. I read something online recently asking whether it is possible to grieve for one child while celebrating another. I gave this a lot of thought and came to the conclusion I was managing to do both. Every time I celebrate something for Shrimp, a small hurdle, eg. I heard a heartbeat, I also think about my little girl. At the moment I’m thinking that at the same stage of pregnancy she was doing the same thing, that at 15 weeks I heard her heartbeat at the Midwife too. I’m subconsciously trying to compare the pregnancies and revelling in the similarities and excited about the differences. In the future every milestone will be in my head that my daughter should have already celebrated this. That Shrimps first cry shouldn’t be the first I’ve heard, that the first birthday cake i make, I should have made one 10 months earlier. For every celebration there is also going to be a mourning, but I am not going to let that stop me celebrating. That wouldn’t be fair. I chose to get pregnant again, I decided I was ready for this mish-mash of joy and grief, I can’t take it out on my baby and I can’t make them miss out on things, celebrations etc. I can’t hate every moment of this pregnancy as I would only end up resenting this poor baby. That said, I worried earlier in the pregnancy that I was forgetting to think about my little girl and getting too wrapped up in this pregnancy – there are so many doctors visits and things going on it would be easy to do, but I soon realised that my mind wanders to my little girl everytime it has a chance. My subconscious is keeping her with me even if my conscious mind has to be occupied with other things. Effy-Mae will always be my first born, my first daughter, and any children I have now will know about her as their big sister. She may have only been in my life for 21weeks, but im not going to pretend those 21weeks didn’t happen, nor am I going to let the grief I still feel from that time affect my future. I think there is a fine line between letting go and letting the grief overwhelm you. I have moments, many, in fact where I wonder why what happened, happened, whether it was preventable, whether it was my fault, and i feel totally overwhelmed and sure that this pregnancy will end the same. Its a crushing feeling knowing that all too easily this journey could be over too, that I could be visiting both my children in graves, but I will not let it affect Shrimp. Shrimp is, of course, my number one priority, I will do all I can to protect Shrimp from my grief and make sure I enjoy every second of this pregnancy, but I don’t think I will ever live a day where I don’t also think of my little girl. that rabbit is so sweet! I believe that you will be more present in the moment from having gone through what you did. You will take no small milestone for granted! I apologize my comment must have read wrong. I meant that everything you experience will seem important and worth cherishing.